Where Does Gravity Come From? Gravity. The average person probably doesn’t think about it on a daily basis, but yet gravity affects our every move. Because of gravity, we fall down (not up), objects crash to the floor, and we don’t go flying off into space when we jump in the air. The old adage, “everything that goes up must come down” makes perfect sense to everyone because from the day we are born, we are seemingly bound to Earth’s surface due to this all-pervasive invisible force. But physicists think about gravity all the time. To them, gravity is one of the mysteries to be solved in order to get a complete understanding of how the Universe works. So, what is gravity and where does it come from? To be honest, we’re not entirely sure. Graphic courtesy University of Tennessee Knoxville. We know from Isaac Newton and his law of gravitation that any two objects in the Universe exert a force of attraction on each other. This relationship is based on the mass of the two objects and the distance between them. The greater the mass of the two objects and the shorter the distance between them, the stronger the pull of the gravitational forces they exert on each other. We also know that gravity can work in a complex system with several objects. For example, in our own Solar System, not only does the Sun exert gravity on all the planets, keeping them in their orbits, but each planet exerts a force of gravity on the Sun, as well as all the other planets, too, all to varying degrees based on the mass and distance between the bodies. And it goes beyond just our Solar System, as actually, every object that has mass in the Universe attracts every other object that has mass — again, all to varying degrees based on mass and distance. 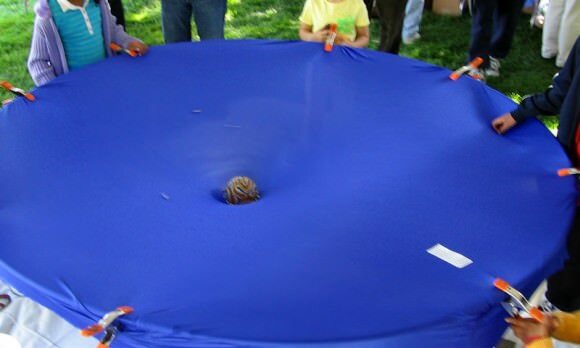 A demonstration of gravity with balls on a rubber sheet. Credit: Stanford University. With his theory of relativity, Albert Einstein explained how gravity is more than just a force: it is a curvature in the space-time continuum. That sounds like something straight out of science fiction, but simply put, the mass of an object causes the space around it to essentially bend and curve. This is often portrayed as a heavy ball sitting on a rubber sheet, and other smaller balls fall in towards the heavier object because the rubber sheet is warped from the heavy ball’s weight. In reality, we can’t see curvature of space directly, but we can detect it in the motions of objects. Any object ‘caught’ in another celestial body’s gravity is affected because the space it is moving through is curved toward that object. It is similar to the way a coin would spiral down one of those penny slot cyclone machines you see at tourist shops, or the way bicycles spiral around a velodrome. A 2-dimensional animation of how gravity works. Via NASA’s Space Place..
We can also see the effects of gravity on light in a phenomenon called gravitational lensing. 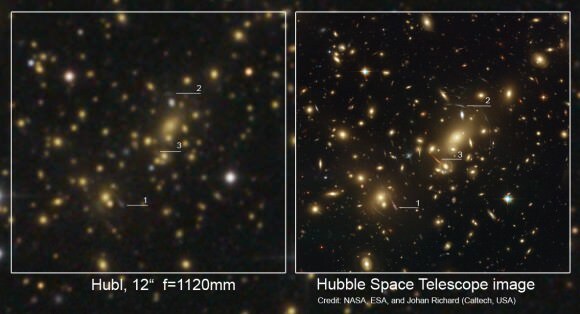 If an object in space is massive enough – such as a large galaxy or cluster of galaxies — it can cause an otherwise straight beam of light to curve around it, creating a lensing effect. Images from the Hubble Space Telescope showing a gravitational lensing effect. Credit: NASA/ESA. But these effects – where there are basically curves, hills and valleys in space — occur for reasons we can’t fully really explain. Besides being a characteristic of space, gravity is also a force (but it is the weakest of the four forces), and it might be a particle, too. Some scientists have proposed particles called gravitons cause objects to be attracted to one another. But gravitons have never actually been observed. Another idea is that gravitational waves are generated when an object is accelerated by an external force, but these waves have never been directly detected, either. Our understanding of gravity breaks down at both the very small and the very big: at the level of atoms and molecules, gravity just stops working. And we can’t describe the insides of black holes and the moment of the Big Bang without the math completely falling apart. And so, the mystery remains … for now. We have written many articles about gravity for Universe Today. Here’s an article about gravity and antimatter, and here’s an article about the discovery of gravity. This recent article discusses how the latest research looks at quantum physics to explain gravity. If you’d like more info on Gravity, check out The Constant Pull of Gravity: How Does It Work?, and here’s a link to Gravity on Earth Versus Gravity in Space: What’s the Difference?. Newton’s Law of Universal Gravitation is used to explain gravitational force. This law states that every massive particle in the universe attracts every other massive particle with a force which is directly proportional to the product of their masses and inversely proportional to the square of the distance between them. This general, physical law was derived from observations made by induction. Another way, more modern, way to state the law is: ‘every point mass attracts every single other point mass by a force pointing along the line intersecting both points. The force is proportional to the product of the two masses and inversely proportional to the square of the distance between the point masses’. Gravitational force surrounds us. It is what decides how much we weigh and how far a basketball will travel when thrown before it returns to the surface. The gravitational force on Earth is equal to the force the Earth exerts on you. At rest, on or near the surface of the Earth, the gravitational force equals your weight. On a different astronomical body like Venus or the Moon, the acceleration of gravity is different than on Earth, so if you were to stand on a scale, it would show you that you weigh a different amount than on Earth. When two objects are gravitational locked, their gravitational force is centered in an area that is not at the center of either object, but at the barycenter of the system. The principle is similar to that of a see-saw. If two people of very different weights sit on opposite sides of the balance point, the heavier one must sit closer to the balance point so that they can equalize each others mass. For instance, if the heavier person weighs twice as much as the lighter one, they must sit at only half the distance from the fulcrum. The balance point is the center of mass of the see-saw, just as the barycenter is the balance point of the Earth-Moon system. This point that actually moves around the Sun in the orbit of the Earth, while the Earth and Moon each move around the barycenter, in their orbits. Each system in the galaxy, and presumably, the universe, has a barycenter. The push and pull of the gravitational force of the objects is what keeps everything in space from crashing into one another. We have written many articles about gravitational force for Universe Today. Here’s an article about gravity in space, and here’s an article about the discovery of gravity.